Kebab was introduced to me by my boyfriend. I didn't really go for it the first few times he asked me to taste it as it was new to me and I found the smell a bit strong. As I could still recall, I was already living in Sweden for more than a year before I finally gave Kebab a try. It was kinda weird but after some bites, I must say I liked it. "Kebab (also occasionally transliterated as kebap, kabab, kebob, kabob, kibob, kebhav, kephav) refers to a variety of meat dishes in Turkish, Persian, Arabic, Caucasian, Central Asian, South Asian and some of the African cuisines, consisting of grilled or broiled meats wrapped in bread accompanied by lettuce and tomatoes with garlic sauce. The most common kebabs include lamb and beef, although others use goat, squid, chicken, fish, or shellfish. Observant Muslims and Jews do not use pork for kebabs because of religious and cultural prohibitions, but pork kebabs can be found in Albania, Armenia, Bulgaria, Cyprus, Georgia, Greece, United Kingdom and India, especially in the state of Goa. 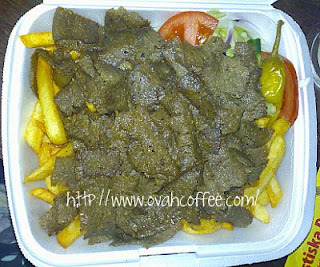 Like other ethnic foods brought by immigrants and travellers, the kebab has become part of everyday cuisine in multicultural countries around the globe." 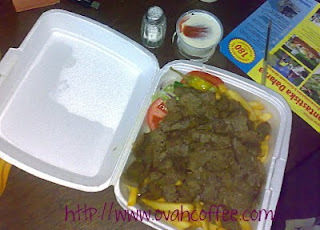 We just had a delicious Kebab dinner while watching Heroes Season 4 Episode 6 awhile ago. Yum!